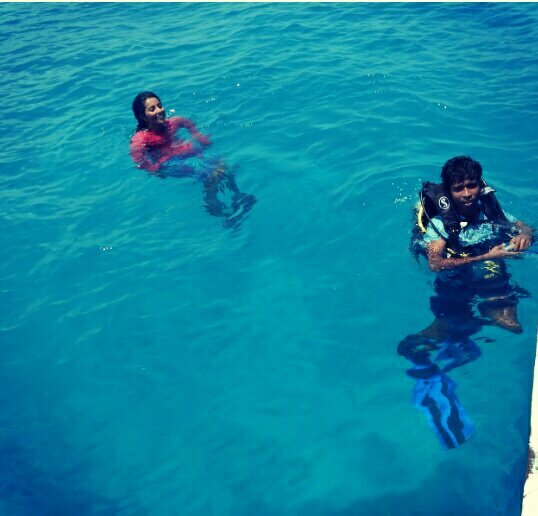 I have three memorable dives in my life eventhough i had many during my lakshadweep life. Obviously the very first one is the the most memorable and the next was an adventurous where i have to dive over the 30m , during the advanced dive course. Besides from these experiences my third dive was arresting my thoughts because it was on a rainy day and my diving partner was a pretty girl. I had that best experience in life was three years back on a shiny rainy day of April . I was a Research fellow in CMLRE Field Research Station at Agatti islands. She visited my office while she was doing her PhD in Indian Institute of Sciences on “Fish foraging behavior” She made a proposal for me to dive with her. I was thrilled because whatever the event ,if it is related with water or ocean I love to be engaged on it. From the deep blue colour of water and corals I heard the voice of a girl “Dude if you are willing, let’s go for a dive tomorrow itself”which made me up from a beautiful dream. Then only i realized that I am on earth. I said, “yes, of course‟. We packed our gears; she has already hired a boat for the diving. Total two diving sites, 14-18m depth, on 45 myts-1 hour interval, that was the plan. We started our voyage to the paradise of beauty. I have been seated on the side of our boat, while I was talking to the boat crew.Suddently I noticed , she was driving the boat. I was so excited as she was beyond my thoughts. From my expression real driver said me that, “don’t worry Sibi, it is gonna be fine, the boat is in safe hands”. She was smiling, while scrutinizing the GPS.When we reached the first mission site boat engine turned off, silence pampered the ocean waves. I started to unpack the gear with all my eagerness, then I heard the splashing sound of water along with water droplets on my hand.I turned back, yes it was her whirling in water like a fish born and brought up in water. The driver unwrapped his experience with her that, it was usual, because she can’t resist herself on diving spots. She can’t wait to stay in the boat, I appreciated that she just loved the water more than herself. When I was ready for the dive, she told me that “I don’t know, whether we make a second dive, its ok, lets go for this one“. Because apparently some light current was there. Right, we both got ready and descend in to the Laccadives coral paradise. Yes, the current therein was deep too. She queried, are you ok? I said “yes I am”. She carried an OHP sheet folded in her left hand, attaches to a PVC pipe. While sighted the group of fishes she just swim towards them and followed with a keen observation, how did they swim and feed, actually I was interestingly observing her because she was like a marine creature while diving, and behaves like to be in home because that much was her attention on diving. She was a well experienced diver, completed more than 200 hours diving in her life. After 30-40 mts, she just looked up, and gestured me to look up, when I followed her signals, my mind became blissful because it was raining. I was really happy to observe from under water that rain drops kissing the water surface. We were able to count each and every rain drops. I didn’t expect this; I am totally thrilled with this fabulous view and the currents were getting stronger and stronger. She gestured that, “We can stop the dive, let’s ascend”. I agreed. When we reached the surface, oh my God, it is hard to explain the intensity of rain alongwith huge waves . While feeling the beauty of nature my aesthetic sense stimulated and i was like in heaven. But the happiness was suddently blasted with shocking news from her mouth that she couldn’t find the boat, and then only I realised, yes our boat was missing. We searched around. While thinking the next plan, again she shocked me by saying “ don’t worry, we can swim towards the shore, someone will definitely see us”. I replied “Yes, may be”. After a 10vmts swim we found our boat was coming towards us, we waved our hands like the Rose did in titanic, our attempt succeeded .yes they noticed us. When we get in to the boat they said that anchor has got broken in the rain and boat was floating on sea. The beauty of rain was putting down because it getting stronger and stronger. While traveling on boat water was splashing to my face hardly, she asked me “how is the rain Sibi?” I didn’t utter a single word, I simply smiled, sometimes words can’t explain the feelings that we really felt. It was really a nice experience in my life; as she stunned me with her diving experiences and boldness and then the nature prized me with lovely rain. However I really enjoyed the occasion because she and the nature were beyond my thoughts.